Land registries play a key role in protecting landholders against dispossession and promoting good governance and economic development. 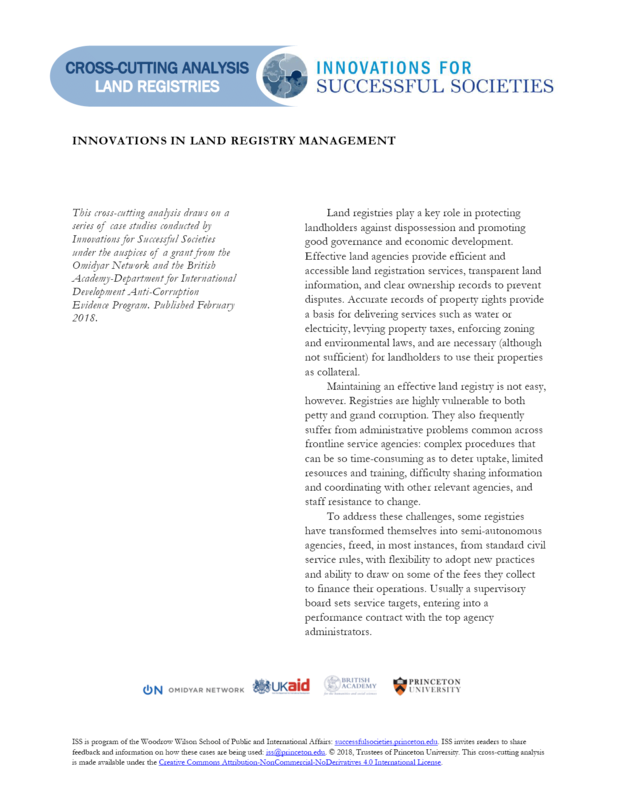 Effective land agencies provide efficient and accessible land registration services, transparent land information, and clear ownership records to prevent disputes. Accurate records of property rights provide a basis for delivering services such as water or electricity, levying property taxes, enforcing zoning and environmental laws, and are necessary (although not sufficient) for landholders to use their properties as collateral. Maintaining an effective land registry is not easy, however. Registries are highly vulnerable to both petty and grand corruption. They also frequently suffer from administrative problems common across frontline service agencies: complex procedures that can be so time-consuming as to deter uptake, limited resources and training, difficulty sharing information and coordinating with other relevant agencies, and staff resistance to change. To address these challenges, some registries have transformed themselves into semi-autonomous agencies, freed, in most instances, from standard civil service rules, with flexibility to adopt new practices and ability to draw on some of the fees they collect to finance their operations. Usually a supervisory board sets service targets, entering into a performance contract with the top agency administrators. Mirroring the governance and ethos of a private firm, this approach, sometimes termed New Public Management, does not work everywhere, but it can buffer registries from partisan influence while also helping them deliver services in more innovative, cost-effective ways that serve citizens better. This cross-cutting brief profiles five experiments with this kind of governance model—two in high-resource countries and three others in lower income settings.